Color and texture are always what grab me first, rather than any subject matter. I love stained glass and ceramics because of the way light constantly changes their appearance. I like to include found objects and stones and shells in my work, to create visual variety. 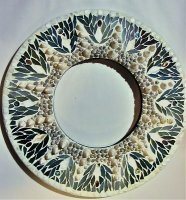 I enjoy doing commissions that incorporate the personality and taste of the client, and maybe even the client’s broken plates, old buttons, or beach glass. Diane is a native of Baltimore. She learned copper foil and leaded glass techniques from Nancy Weisser of Kensington, Md., and studied mosaics with Rick Shelley of Baltimore and Ilana Shafir of Israel.